This introduction has been setup to get you started as quickly as possible with the newest member of the JBoss Integration portfolio, JBoss A-MQ, which will be available very soon. We have put together a three part video tour of the product, an example quick setup of the product and the installation of an existing project that is then deployed on JBoss A-MQ. The project was existing work done by Charles Moullaird, a brilliant consultant that has done many projects using this technology. This is a very quick and dirty introduction to the JBoss A-MQ product and gives you an idea of what the components are. It sets the stage for the following two parts with an overview of the websocket demo project. The product is installed and configured right before your very eyes in no time at all with a fully automated project setup script. The server setup is shown using the latest JBoss Developer Studio and you are ready to get going. 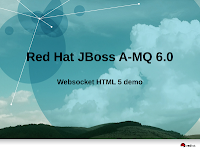 The demo is imported into the JBoss Developer Studio, we start the server, deploy our project and walk you through the websocket demo. You now have a complete, repeatable, and interesting JBoss A-MQ integration demo story that you can share with all your friends and family. For those attempting to use the project shown in the videos, just rename the Early Release downloads you find here http://www.jboss.org/jbossamq (registered jboss.org user needed) to jboss-a-mq-6.0.0.GA.zip.